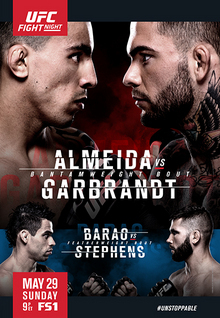 The poster for UFC Fight Night: Almeida vs. Garbrandt. UFC Fight Night: Almeida vs. Garbrandt (also known as UFC Fight Night 88) was a mixed martial arts event held on May 29, 2016, at the Mandalay Bay Events Center in Las Vegas, Nevada. A bantamweight bout between top undefeated prospects Thomas Almeida and Cody Garbrandt headlined the event. Keith Berish was very briefly linked to a bout with Jake Collier at the event. However, Berish pulled out due to injury on March 31 and was replaced by UFC newcomer Alberto Uda. Joe Proctor was expected to face Erik Koch at the event. However, Proctor pulled out of the fight on April 21 citing injury and was replaced by Shane Campbell. Carlos Diego Ferreira was expected to face Abel Trujillo, but was pulled from the event on May 13 due to a potential USADA anti-doping violation stemming from a recent out-of-competition sample collection. In accordance with the UFC Anti-Doping Policy, Ferreira has received a provisional suspension. Additional violation information will be provided at the appropriate time as the process moves forward. He was replaced by UFC newcomer Jordan Rinaldi. The following is the reported payout to the fighters as reported to the Nevada State Athletic Commission. It does not include sponsor money and also does not include the UFC's traditional "fight night" bonuses. ^ a b Staff (2016-05-30). "UFC Fight Night 88 draws announced attendance of 5,193 for $359,000 live gate". mmajunkie.com. Retrieved 2016-05-30. ^ a b Staff (2016-03-18). "Thomas Almeida vs. Cody Garbrandt being targeted for UFC Fight Night 88 main event". mmajunkie.com. Retrieved 2016-03-18. ^ Thomas Gerbasi (2016-03-19). "Almeida-Garbrandt headlines May 29 event in Las Vegas". ufc.com. Retrieved 2016-03-19. ^ Guilherme Cruz (2016-03-31). "Undefeated Alberto Uda signs with the UFC, replaces Keith Berish vs. Jake Collier at UFC Fight Night 88". mmafighting.com. Retrieved 2016-03-31. ^ Staff (2016-04-21). "Shane Campbell replaces Joe Proctor, meets Erik Koch at UFC Fight 88". themmareport.com. Retrieved 2016-04-21. ^ Staff (2016-05-13). "Diego Ferreira removed from UFC Fight Night 88 due to potential USADA anti-doping violation". mmajunkie.com. Retrieved 2016-05-13. ^ Staff (2016-05-17). "Replacement Jordan Rinaldi meets Abel Trujillo at UFC Fight Night 88 on May 29". mmajunkie.com. Retrieved 2016-05-17. ^ "UFC Fight Night: Almeida vs. Garbrandt". Ultimate Fighting Championship. Retrieved 2016-03-17. ^ Tristen Critchfield (2016-05-30). "UFC Fight Night bonuses: Garbrandt, Stephens, Barao, Collier pocket $50K Awards". sherdog.com. Retrieved 2016-05-30. ^ Staff (2016-05-31). "UFC Fight Night 88 salaries: 23-fight UFC vet Jeremy Stephens earns top payout". mmajunkie.com. Retrieved 2016-05-31.